This is a vital set for Warlock enthusiasts. A number of these recordings were made before Warlock’s death in 1930 not that this in itself is any guarantee of authenticity of approach but there is fascination in hearing these contemporaneous accounts..
Anthony Bernard's Capriol is not taken at a dawdle. The sound is a little boxy but vivid and even brusque in a way that, inthe finale, recalled Bartók. The Delian Serenade for Strings is taken by Barbirolli at a dry-eyed speed but one can still feel the minute attention to dynamic and pace by the instant more so than with Bernard in Capriol. Unsentimental stuff. It’s unnerving to hear Capriol in a version played by Szigeti as transcribed by him for violin and piano. The pianist is none other than Nikita Magaloff. A shame that each movement is not separately tracked. It is played with greatly accentuated emphasis and fierce tone. Lambert's 1937 Serenade also sounds fast by latter-day standards. It’s 40 seconds shorter than Barbirolli in 1928. The sound is more agreeable in this case with heightened fullness of tone. Lambert continued that same year with a Capriol also with his own string orchestra. Though overall only 14 seconds longer than Bernard it sounds less hectoring - more modern. The tone is very nicely rendered and it's quite pleasing to the ear overall. 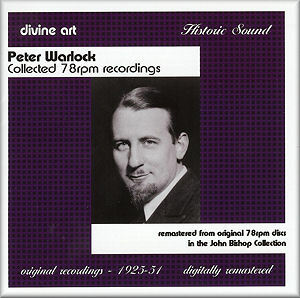 The 1935 recording of Warlock's version of the Purcell fantaisie no. 3 is sedate and stately in a version played Casals-style by the Pasquier Trio. Ten years later the Griller take Warlock's arrangement of Purcell Four Part fantasia. This is seriously done again with stately concentration and gravity of expression. The second disc is full to the brim with 35 songs. The Dawson Captain Stratton's Fancy is sung with boozy character. It’s full of life and expression and still works. John Goss, a good friend and close associate of the composer lays into Oh Good Ale with the Cathedral Male Voice Quartet. Flow not fast ye fountains sounds rather stilted though Diana Pulton plucks away at the lute with an emphatic will as she also does in There is a garden, O Eyes and Come My Celia. Goss does little in the way of expression but he is very clear in his enunciation. These January 1928 recordings are a valuable sliver of history. The English Singers are recorded in the Corpus Christi Carol the year before the Goss recordings - it’s quiet and fast. The recording was on the, for me, little heard of Royston label. The baritone John Armstrong sings Sleep and Chopcherry with the International String Quartet for a National Gramophone Society disc in 1931. A quick pace is in evidence again; the results seem unfeeling. The Fox is sung eerily and ruthlessly by Parry Jones - very impressive and even slightly gothic-macabre - in 1934. He is more honeyed in Come Sleep and sunset warm though warbly-lachrymose in Take O take Those Lips away. Sweet and Kind is better. As ever I saw again finds Parry Jones in good stalwart form yet sensitive to the word-setting as he also is in The Passionate Shepherd. Thankfully Leslie Woodgate's BBC Chorus, recorded in 1936, are so much better than the English Singers in the Corpus Christi Carol. Peter Pears even sounds good, in springheel form, well before a sollipsistically beloved bray had become part of his stock-in-vocal-trade. From the same disc we hear a surgingly lusty Cornish Christmas Carol. It's to the tune we now know as Nowell! Nowell!. In 1941 Cecil Cope recorded the six nursery jingles for the BBC Transcription Service. This is silently surfaced and sounds wonderfully alive and clean for these little charming trivialities. In 1941 and 1943 Roy Henderson recorded some eight Warlock songs - all here. Milkmaids and Captain Stratton's Fancy Henderson is accompanied by Eric “Griffen” in 1943 but otherwise it’s Gerald Moore. Surely the accompanist for the first two is in fact Eric Gritton? Henderson's tight tone ensures clarity of enunciation - very sharp uptight diction. He relaxes somewhat for Passing By but he seems to miss the tenderness. There’s too much of the Captain Stratton about this. I had fears for My Own Country - one of my favourite songs among the Warlock solo items. In fact he does this very well indeed, assisted by the wonderfully sensitive Gerald Moore. Fair and True comes off less well, despite the strange tonal world of the initial piano notes. Piggesnie skips along in sprightly fashion and Henderson does here take the hint. The three songs by Nancy Evans are again taken with Moore but there is a dearth of feeling in Sweet and Twenty. Consider is not a song I recall hearing before. In fact it works well in its swirling aspirational scena style. Evans tackles Come Sleep very well. Rest sweet nymphs transports us to Truro County Girls school choir in 1946 where the pupils are conducted by the attentive Miss Sanders. It's very lovely and is lovingly done. The First Mercy is hauntingly sung by boy soprano Master Billy Neeley. Again a wonderful Corpus Christi, this time taking 4.45 against the 1936 BBC Chorus version and The English Singers 3.03 in 1927. This 1950 HMV version is conducted by Woodgate with The Festival Singers and with Flora Nielsen. It’s a master-work. Wonderful stuff but sounds even older than its 1950 vintage and making that Cecil Cope BBC transcription job all the more miraculous in its superbly preserved clarity. Dennis Noble and Moore, again totally reliable yet full of blazing imagination, tackle the mystical Frostbound Wood in 1951. They are accorded fine sound. The Fox is as nicely macabre - even melodramatic - as Parry Jones in 1934. In fact Parry Jones does it with less grease-paint. Oscar Natzke has been celebrated in various sets over the years and here he does a rather populist Captain Stratton's Fancy with Graingerian ‘chuckles’ in the orchestra and the piano solo. Dawson is non pareil but Natzke is pretty good and he does have the benefit of the orchestra. All the transfers are by Andrew Rose of Pristine Audio. The originals were painstakingly collected by John Bishop - he of Thames Publishing fame. Bishop did so much for the music of Warlock and many other British composers. By the way, Boydells - a successor to Thames - are offering all four volumes of the Warlock letters at a very attractive price - just contact them for further details. An item 'missing' from this collection is a recording of The Curlew by John Armstrong with the International String Quartet. Its inclusion would have necessitated a third CD - the recording is available as a download via Pristine Audio. I could happily have done without the two Purcell arrangements if we had conveniently had that other version of The Curlew there. Thanks to Divine and to the funders for the set, the Peter Warlock Society. This single-width 2-CD set is smartly presented. There are some nice pictures of the soloists and everything is fully documented with lots of local colour. Full discographical detailing is supplied. The wonderfully extensive notes are by Stephen Sutton and Giles Davies; no words though.